The British and Americans speak the same language, but use it differently. Indeed, it can sometimes be misunderstandings between them, but this is no reason to believe that the British and American English are so different that the English is absolutely not understand Americans. In fact, American English on the prevalence significantly surpassed its original source. It is very different from the classic British version, but not enough to be a completely new language. However, differences can be found in all aspects of grammar, pronunciation, vocabulary. Well, in this article I would like to stop on lexical differences between American and British English. Let us, at last, will investigate the use of words, not to be trapped and avoid misunderstandings in the English-speaking countries. So, let’s begin! Often you can find the words that are written in exactly the same but have different meanings in the United States and the United Kingdom. For example, in the UK, if you need to use the underground mode of transport, and you ask a passer-by: «Could you tell me the way to the nearest subway station?» («Can you tell me how to get to the nearest subway station?»), Your a chance to get into the subway zero, as the British, the word meant only the subway underground passage. But they Underground — underground. How many servings of chips it was eaten by the British in America, when they only wanted to order a little crisp, like the one that can be enjoyed at McDonalds! Chips, the British — crisps, chips and the word they mean fries. In America, the opposite is true: chips — chips, fried potatoes — French Fries. «Oh, no! I got a flat! «His friend from Britain clearly does not understand the tragedy in the voice of his interlocutor, because his understanding of a phrase meaning» Oh, no! I bought an apartment! «While the Americans out of the mouth sounded joyless news that he broke a wheel, as the flat = flat tire — the punctured tire, the tire is deflated. What a shock plunge Englishman on the road sign «Do not step on the pavement», if it is to meet him in America. Indeed, in the UK pavement — pavement and in the United States this word has the opposite meaning — pavement, road, roadway. Let’s say you decide to compliment a good looking and much postroynevshey colleague from London. You gently noted: «You look great! Nice pants! «You are incredibly lucky if your friend is shy and modest. In this case, it appears on her cheeks slightly flushed, and she hurried out of sight. 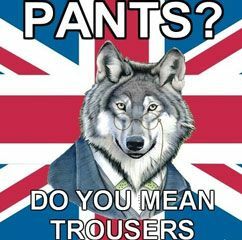 But if not timidity and shyness of its quality, then you have every chance to get a slap in the face, as in the British version of pants — underwear, while in America it is just pants. Few serious moments. For example, the verb to hire and to rent the main value — to pay for the use of something. 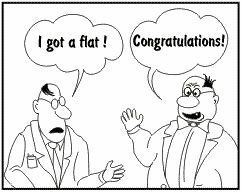 In Britain, the verb to rent is used mainly when it comes to long-term lease (to rent a house, a flat, a room). To hire used when talking about a short-term lease (to hire a bicycle, a car, a dress), although in recent years in the UK are increasingly using the expression to rent a car. In America there is no such distinction. For any kind of rent he used the word to rent. To hire it is of fundamental importance to give a job to smb. Speaking of distance, in the UK we use the word farther and further, when we want to say that something is more than another thing. These two words are used interchangeably. But in America, using only a word farther. (BrE) London is further / farther than Glasgow. — London further than Glasgow. (AmE) New York is farther than Texas. — New York further than Texas. We would like to mention the names of stories in the British and American versions. Now, I suggest you watch the video and remember the words associated with food. Many of the names of vegetables and different dishes in British and American English. These differences are important to remember, to know that you order in a restaurant. As we have previously noted, the Americans do not like complexity and three-story structure. This is especially true when they say about time. Half past six to 6:30 — not for them, six thirty — simple, clear and logical. Why no! Some other differences you can see in the illustration. And finally I would like to give advice to learn English. 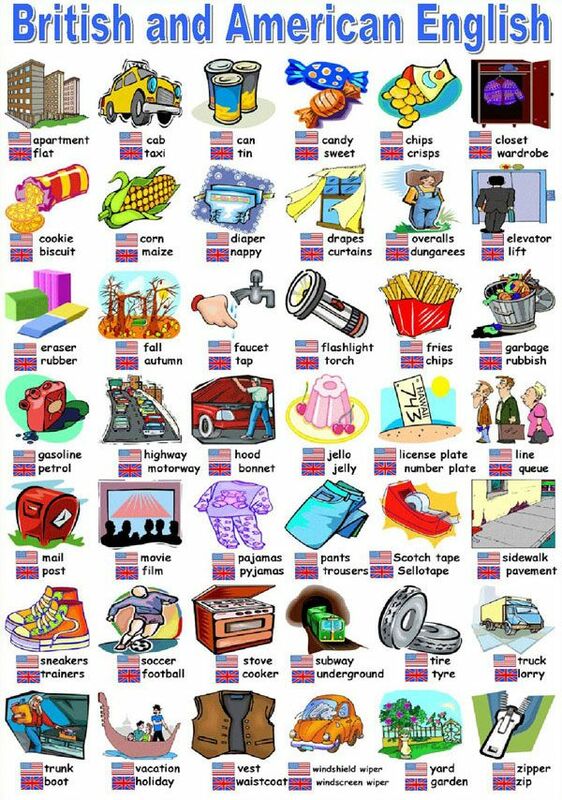 Indeed, there are some differences between American and British variations in language. Opinions differ about which option to choose to study. Someone insists on the US, arguing that the choice of its simplicity, widespread and modernity. In response, the British English supporters accuse them of inaccuracies and neglect in the use of language. Each one in its own right. But it is logical to teach both, to understand all and be able to adjust to any environment, no matter where you found ourselves. If someone your speech seem too literary and UK, you will not reproach. And if you’re too simplify their statements (supposedly American style), has all chances to appear illiterate. Teach both variants of the English language, stores all the lexical differences, remember the grammar simplification, write competently, and in talking stick to one option. Let’s check that you have time to remember for 10 minutes of reading this article. The Memory Palace Technique, or what to patch leaky memory?